Lightweight, breathable pot designed for hydroponic gardening with soil-less growing mixes. 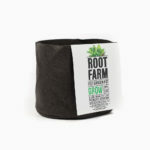 Perfect for use with Root Farm Hydro Garden Potting Soil or Root Farm Hydro Garden Coco Coir Blend. Felt material releases heat and prevents root circling. Available in small, medium, and large sizes. Click here to learn about what you can grow in each size. Can be used for indoor or outdoor growing. Machine washable. 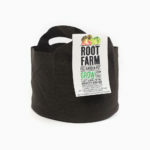 Root Farm Felt Garden Pots are made from a unique breathable material that is great for hydroponic growing because it releases heat as your plants grow, prevents root circling, promotes aeration, and makes plants grow right at home. Small size is great for growing herbs and leafy greens like basil, cilantro, sage, lettuce and kale. Medium size is great for growing herbs, vegetables, and fruits. 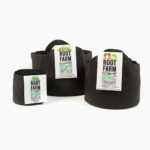 Can be used to grow a single plant like cucumbers or eggplants, or multiple plants like beans, peas, basil and lettuce. Large size is great for growing bigger plants like tomatoes or peppers, or multiple plants like potatoes and strawberries. 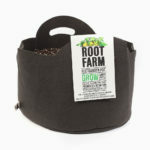 One bag of Root Farm Potting Mix or Root Farm Coco Coir Blend fills 6 small pots, 2 medium felt pots, or 1 large felt pot.